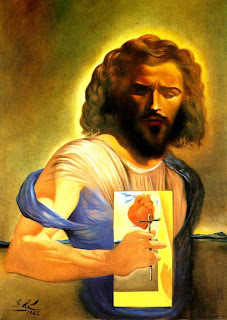 Dali's Sacred Heart portrays so clearly and frankly the beauty, strength, intensity and raw humanity of Christ's divine heart. This is not the passive Christ of so much religious art but rather the strong Christ of self-emptying love whose heart was crucified for us. Here is a Christ strong enough to carry any burdens we might lay at his feet; a heart tender enough to welcome any who seek refuge within it; a heart unafraid to expose itself that all might know its love and mercy. Salvador Dali (May 1904 – January 1989) was a Spanish Catalan surrealist painter, sculptor, graphic artist, and designer. Although he is best known for his Surrealist works, Salvador Dali incorporated countless styles and themes into his work throughout his long and illustrious career. In 1940, as World War II started in Europe, Dali moved to the United States and eventually returned to the practice of Catholicism, and many of the images he utilized in his mid and late career were religious in nature. just so you know, at the bottom of this painting, he had an inscription saying "sometimes I spit on my mother's portrait for fun." contextually, this has a whole lot less to do with Christianity, and a lot more to do with the surrealist movement and his relationship with his father. hahaha. exactly. These people obviously don't know anything about dali. " returned to the practice of Catholicism"... nice try.